Full Sail Brewery makes a variety of delicious beer. They do, however, own the Session beers, which I can't exactly say fit the delicious label. Regardless, the bulk of their beers are worth trying. 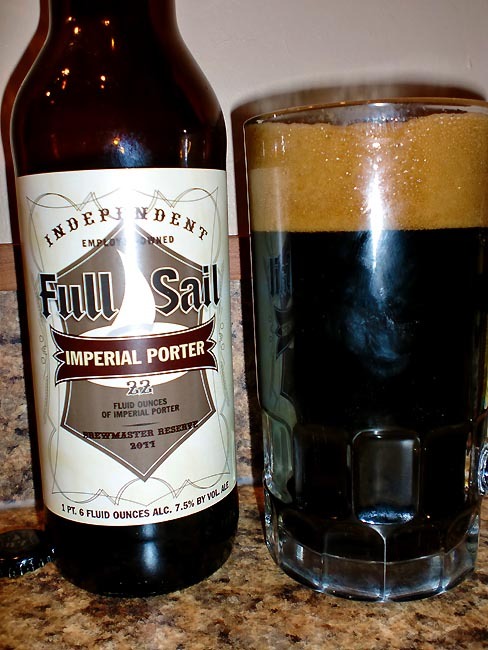 Around every ten weeks, Full Sail Brewery releases a new Brewmasters Reserve beer. Half of this year's Imperial Porter will be aged in bourbon barrels as they usually do and re-released next year as their Bourbon-Barrel Aged Imperial Porter. Judging by this year's Imperial Porter, that's one to look out for. For now we are looking at their non-barrel aged Imperial Porter. It racks in at a measly 7.5% ABV, which is considerably weak by imperial standards. But, in this case, I will forgive them. 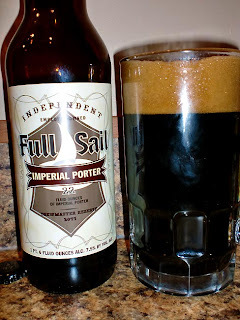 The Full Sail Imperial Porter Brewmasters Reserve 2011 pours a deep, dark brown, almost black. It smells of toasted malt and dark chocolate, but you can obviously tell it is not a stout. It tastes like toasted malts, roasted nuts, and an earthiness that I enjoy. It is deliciously thick and creamy. This is nothing over-the-top or ground-breaking, but it is well-balanced and very drinkable. It is obviously lighter than an imperial stout, without being too light. The thickness of this brew really holds it together. It is a good beer and worthy of trying, but I'm waiting for the bourbon-barrel aged version next year. Drink This: if you want a delicious, well-rounded, dark but not too dark beer. Don't Drink This: if you want something extreme and ridiculously flavorful, or some watery mass-produced beer. This is neither extreme. This is a good beer, yes, but nothing extraordinary. I wouldn't pass it up if someone offered me one, though. This could potentially be a good beer to convert Guinness drinkers to more of the craft brew scene.